An encounter with ancient Egypt touches most of us at some point in our lives and leaves few of us unmoved by its remarkable culture. The museum has nearby, in the 555-foot-high Washington Monument, an abiding resonance of ancient Egypt. The obelisk is both an icon of the city familiar across the globe and an icon of ancient Egyptian culture that emerged during the Middle Kingdom when Egypt was at the height of its power. In museums, in literature, and at the movies, ancient Egypt excites our imagination. It was, after all, a culture that formed a large and complex nation state. But long before that, the Greeks and Romans were fascinated by Egypt. The Romans were great producers and consumers of things, and through their knowledge of Egyptian culture they "Egyptianized" their own villas, temples, and grand monuments with objects taken from Egypt itself or made in imitation of Egyptian models. Through the centuries after the fall of the Roman Empire, evidence of ancient Egypt slipped into obscurity until interest revived during the European Renaissance of the 15th and 16th centuries. 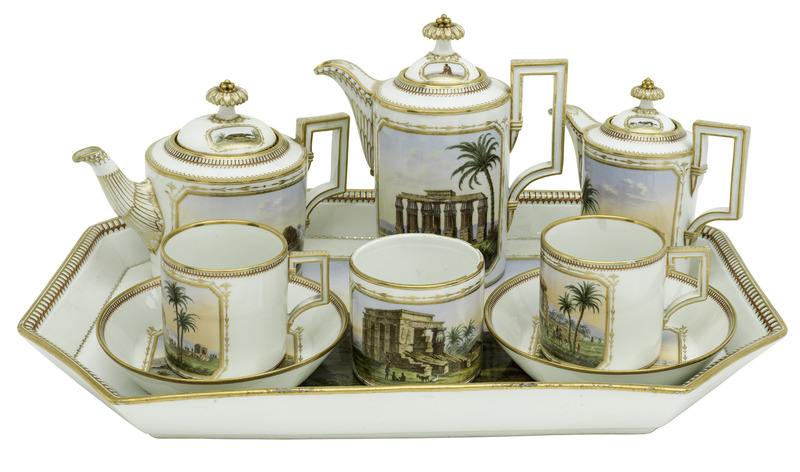 In the Egyptian Revival of the late 18th century, architects, designers, artisans, and manufacturers were quick to pick up on the commercial potential of the mystifying motifs, hieroglyphs, and iconic remains of ancient Egypt available to them in books and engravings. Responsibility for the transition from "Egyptian Revival" to "Egyptomania" lies with France and Napoleon Bonaparte, who in May 1798 sailed for Egypt with a fleet of 400 ships carrying about 20,000 troops. One purpose in this campaign was to cut off the British land route to India through the Isthmus of Suez, and secondly to remove from power the Mamluk rulers of Egypt, relieving the Nile inhabitants of their oppressors and introducing French republican values to a population that they believed (wrongly) would welcome them with open arms. Napoleon's campaign was not a military success, his fleet was destroyed by the British at the Battle of Abū Qīr Bay near Alexandria on August 1, 1798, thus isolating the French army on land in Egypt and restoring British control of the Mediterranean Sea. 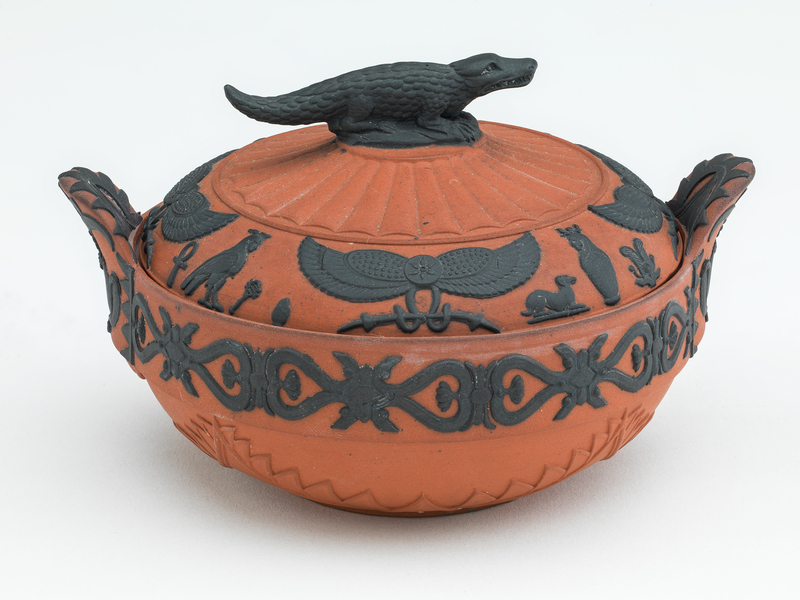 This victory for the British sparked a high demand for Egyptian-style consumer goods in Britain, and the Wedgwood Manufactory responded with tea services decorated with Egyptianized motifs, as seen in this sugar bowl. 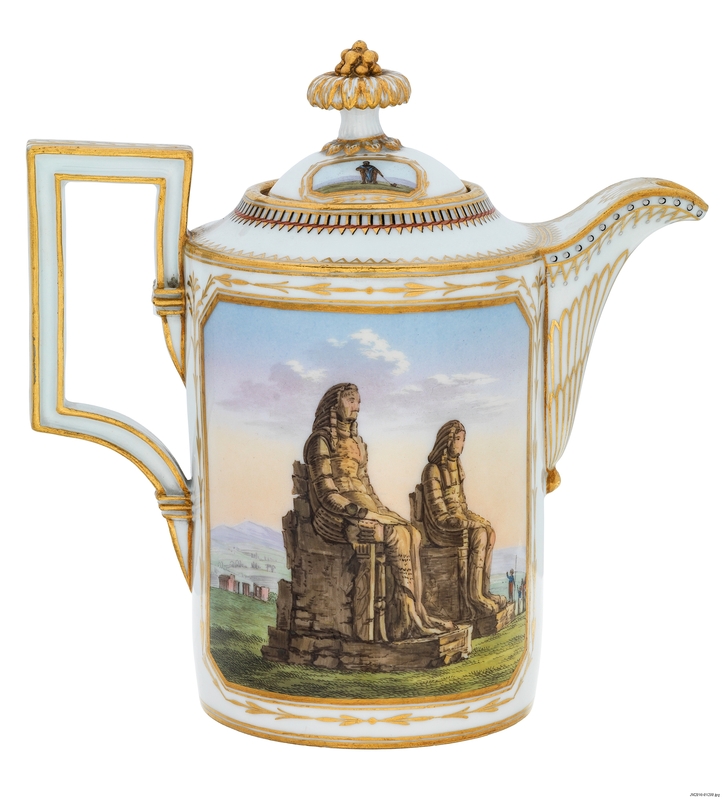 Novel items from Josiah Wedgwood's Etruria, and other Staffordshire potteries, were popular consumer items in the post-revolutionary United States before American ceramic manufacturing became well established in the 19th century. Napoleon scored another kind of achievement, however, that has endured to this day. The general took with him to Egypt 150 men who were specialists in the sciences, engineering, and antiquities, and they had the support of surveyors, artists, and printmakers. When the French left Egypt in 1801, defeated by the British and by disease, the "savants," as they were known, returned home with a wealth of material about ancient and modern Egypt. 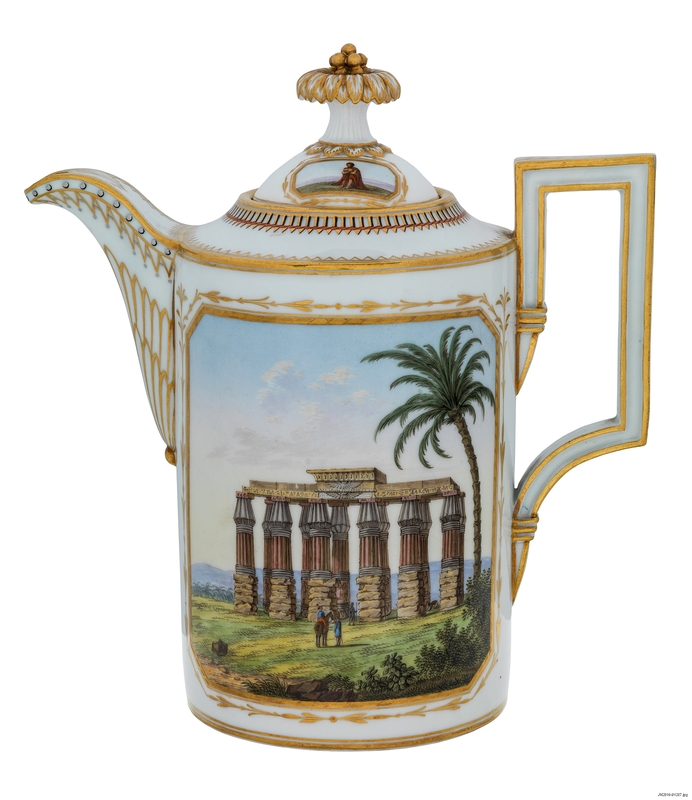 One of their number was Baron Dominique Vivant Denon (1747–1825), an art collector, diplomat, antiquarian, and artist who for 13 months traveled with part of the French army in chase of the Mamluks into Upper Egypt, recording in his drawings every site of Egyptian antiquity he encountered. 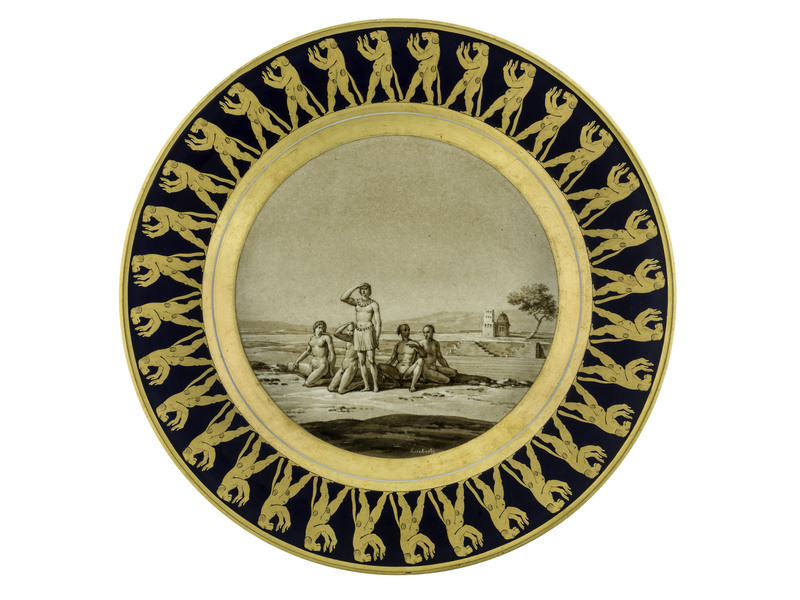 Not only that, he also wrote a vivid account of his experiences, the Voyage dans la Basse et la Haute Egypte, published in 1802 and illustrated with prints after his drawings. Denon's Voyage was translated into English almost immediately, and his work continued by draughtsmen and engineers who remained in Egypt after he returned to France. The comprehensive and astonishing Description de l'Égypte, published between 1809 and 1829 in 20 volumes, contributed to intense public interest in the impressive discoveries made in the desert kingdom of antiquity. The decipherment of hieroglyphs in 1822 laid the foundation for the academic pursuit of Egyptology, as well as stimulating further the popular and commercial movement of Egyptomania in Europe and America. 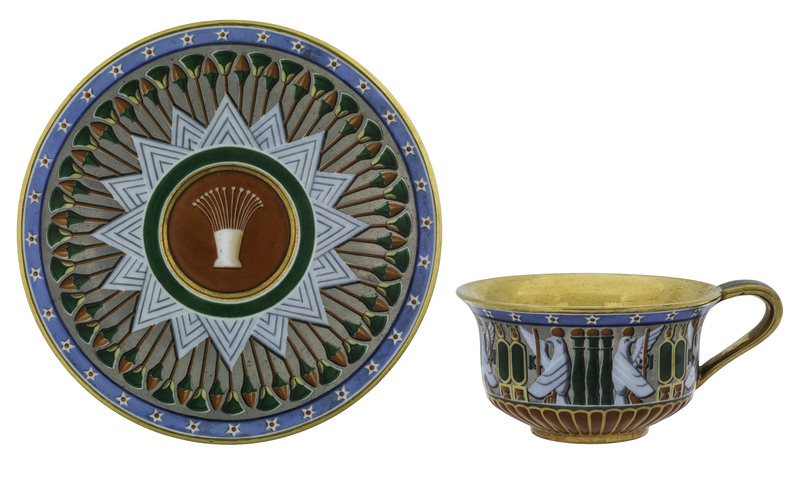 Egyptian antiquities became part of 19th century public entertainment and education, sparking the imagination of American and European audiences. Writers of fact and fiction, museums, movies, and makers of material objects have all responded to our Egyptomania since then. The Egypt of the Pharoahs is not such a mystery to us now, but that has not dimmed our fascination or our respect for this ancient culture. *Mamluk. Originally an army of slaves recruited in the 9th century Abbasid Caliphate (Mamluk means "owned" or "slave" in Arabic), the Mamluks (or Mamelukes) became powerful military rulers in the Islamic world, notably so in Egypt until 1811. Sarah Richards is a project assistant in the Division of Home and Community Life. A specialist in ceramics, she likes to see that interesting objects from the collection have a presence online.